If your life were revealed to be a lie, what would you find meaning in? If your purpose was created for only one function, then is there a way to grow beyond it, even if you’re told it’s impossible? Nier: Automata doesn’t just ask this of the player; it flat out begs you to figure it out. The story is an existentialist thought experiment wrapped in a hack-n-slash style RPG that treats its subject matter with the gravitas it deserves. At the same time, it adds humor and carefree attitudes to keep things from getting bogged down in the crises the characters go through. And as the final act wrapped up, I realized the experience made me a richer human being overall. Several thousand years into the future, a war between humanity and an alien race of machines has forced the humans to retreat to the safety of the moon. To combat the threat, the Council of Humanity created an army of androids known as YorHa, capable of combating the advanced alien life forms. 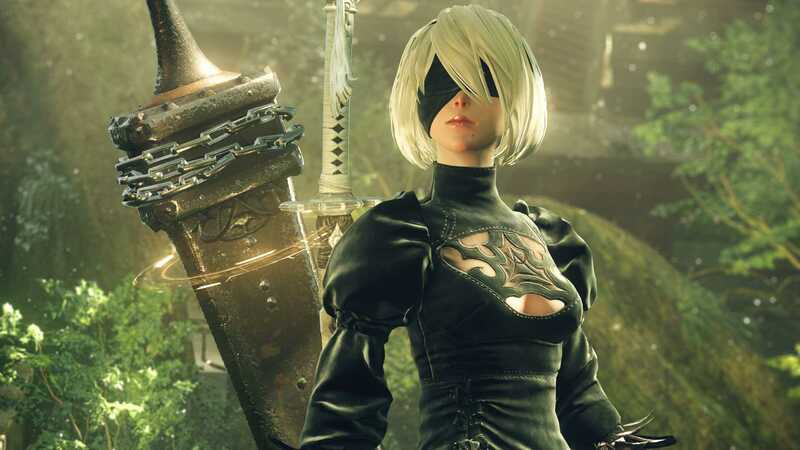 You are assigned the role of a YorHa android named 2B: a female combat model out on a mission to figure out why the machines are suddenly changing their behavior. She is accompanied by 9S: a male scanner model designed to collect and analyze intelligence. 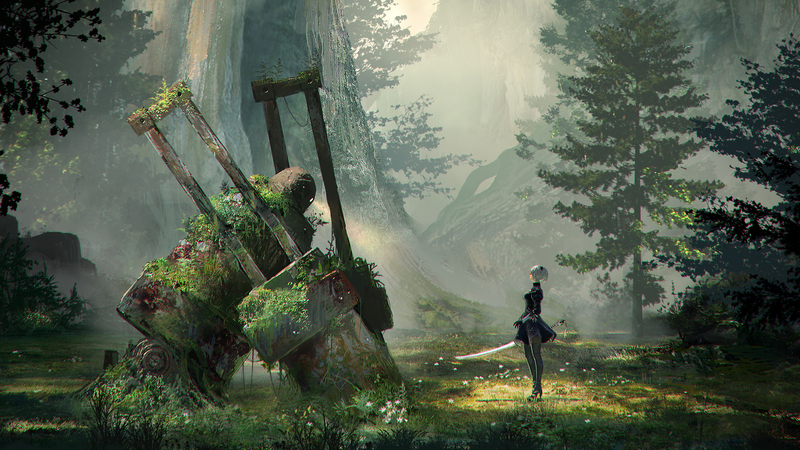 The story focuses mostly on the relationship between 2B and 9S and their discoveries of the ancient secrets about the ancient Earth they land on. 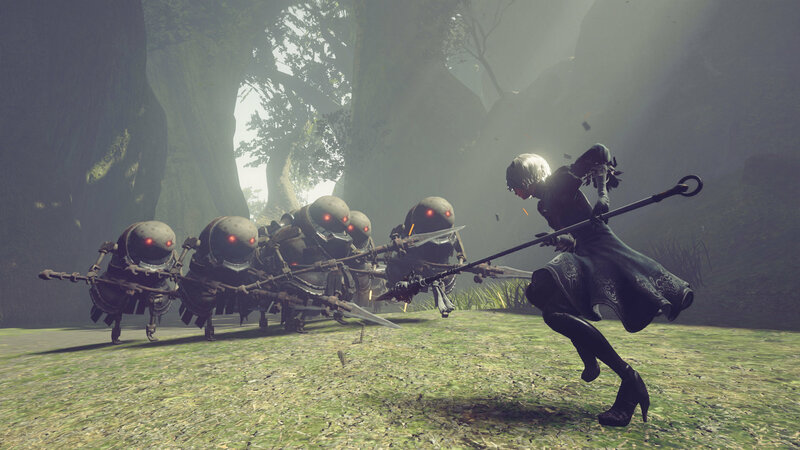 Emotions are forbidden within YorHa, yet due to having been created by humans, they strive to become more like them, creating a paradox central to their internal conflicts. 2B is cold and callous towards 9S, taking her duty as more important than relationships due to her past. 9S, being inquisitive by design, tries desperately to gain 2B’s attention and trust while also struggling to understand the world he lives in. The road these two travel as characters is one of romance, tragedy, and despair as they discover more and more about the mysterious machine behavioral change. Without spoilers, the limits of their duty and personalities are pushed to the extreme and end up leading towards plot twists less about the actual story and more about the characters’ behaviors, which is a much more unique take on storytelling. That’s not to say that the main plot isn’t fascinating as well. You meet several characters throughout the adventure. 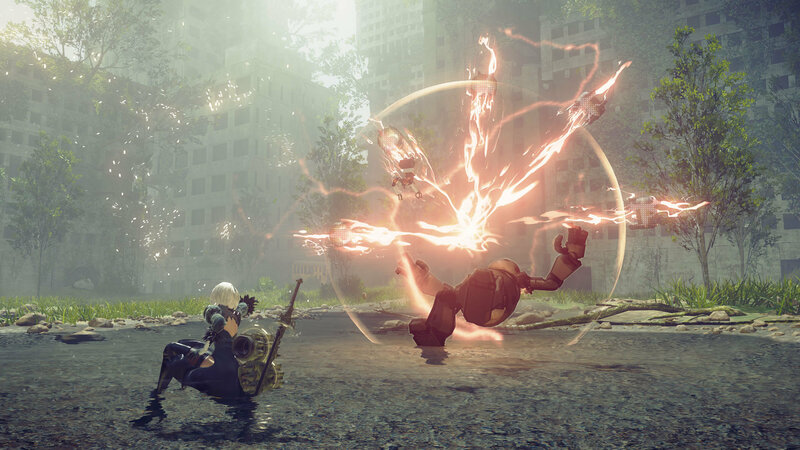 From 2B’s cheery operator 6O, 9S’s stoic 21O, the honor-bound YorHa commander, the free-thinking pacifistic machine Pascal, and the twins Adam and Eve – two humanoid machine creations – everyone has a character arc. All the characters feel like fully developed people that got an entire chapter devoted through them in a book. The twists the main plot takes border from the stunning to the ridiculous, which might put off some people. That is, until they realize that the events on the ground are insignificant compared to the wars being waged within each character’s mind. Take into account the vastly different narratives that occur each time you “complete” the campaign, and you have unique perspectives each time you see events you’ve played before as different characters, right up to the very end which dares to throw everything at you all at once without feeling at all overwhelming. You might be thinking that, being related to the original Nier, that you would need to play it in order to understand the plot. 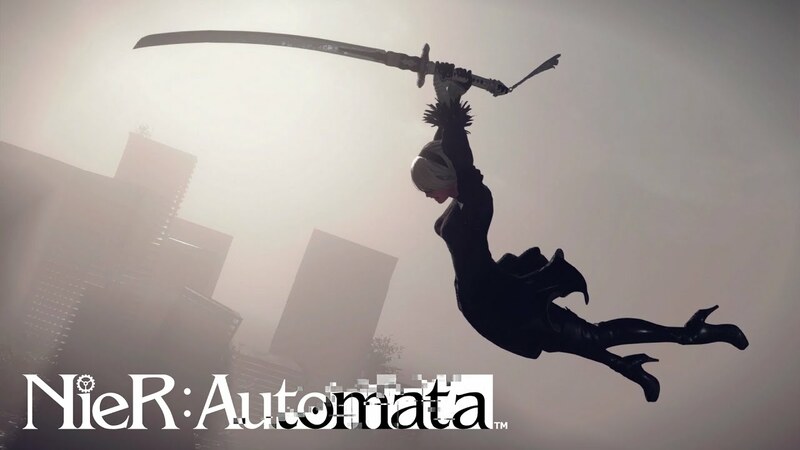 While there are several references to events from that game, as well as a few character cameos, there’s not much of a “direct” connection, per se, given the time frame of the narrative in comparison to Nier, thus it’s not required playing for understanding Nier: Automata. Which is a blessing, since Nier: Automata is loaded to the brim with intense philosophical themes. Using ideas taken from Frederich Nietzsche, Jean-Paul Sartre, Soren Kierkegaard, Immanuel Kant, and other prominent existential thinkers, the game takes these ideas and tries to apply them to workable scenarios. For example, does Kant’s idea of the Categorical Imperative – basically the Golden Rule in more scientific terms – work if you have no true understanding of what morality even means? If existence precedes essence as Sartre claims, then what happens when your existence relies solely on a premeditated purpose that gets you killed if you disobey it? Does Nietzsche’s Will to Power model even make sense if there’s no such thing as free will, adding further insult to Sartre’s claim that we are “condemned to be free”? The game not only asks these questions, but pulls no punches on them by putting them into realistic scenarios that, when put into practice, allows your actions and the actions of the characters to critique the philosophy and apply its implications into the consequences. It’s a bit heady, especially if you have minimal understanding of the finer details of the people and ideas they utilize, but the nature of the medium allows these ideas to penetrate even the most novice of philosophers (as we all tend to be) and gives one pause about what their own morality and life should be about in terms of meaning. I know that, for me, I ended up feeling both called out and challenged by these ideas, and I was forced to take my life into account to try and change it for the better. Okay, enough of the story already! I said was a game, right? Well, it is. This is a hack-n-slash RPG that utilizes the bare minimum necessary to qualify. You have two types of attack – light and heavy – as well as a dodge function. Utilizing these moves in various combinations allows for some flashy over-the-top maneuvers that look as powerful as they hit. You can either juggle enemies into the air to prevent them from even attacking, or smacking down flying enemies to your level to destroy their advantage. However, some don’t even try to attack directly, instead preferring to fire at you from a distance with giant purple bullets of death reminiscent of the bullet hell genre. Some of the gameplay segments even become said genre within the game. Well, thankfully you have a Pod that acts not only as a navigation tool and mission control, but can also utilize an array of distance weapons, from a sub-machine gun to lasers to cluster bombs, giving you a fighting chance. While the controls are simplistic in nature, the unique array of weaponry you find, such as swords, spears, gloves, and even giant axes allow for different combos and move that keep the feel of the game from being monotonous. 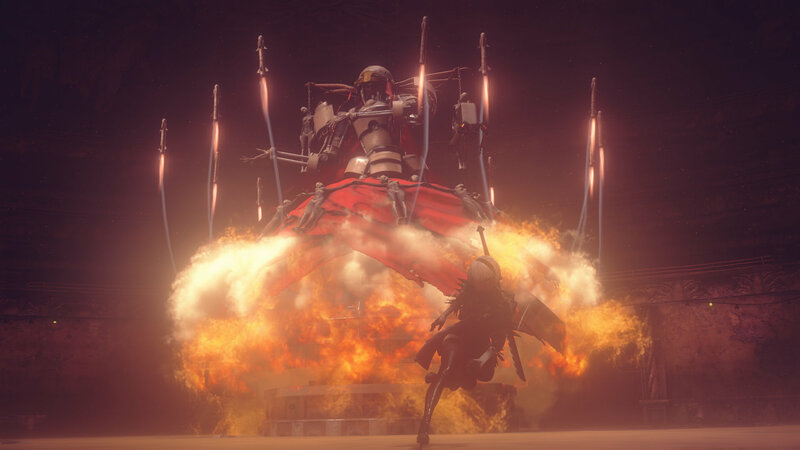 Hell, even 9S has a secondary ability to hack into machines, changing the genre further by adding twin-stick shooting mechanics into the mix. Your abilities are further enhanced by acquiring chip upgrades, which boost your attack damage, dodge speed, hacking proficiency, defense and healing abilities, as well as your Pod’s abilities. Should you do fall in combat, you lose the chips you currently have equipped, as well as leaving behind your previous body. Going back to that body will allow you to retrieve the chips, as well as potentially giving you an AI companion to fight alongside you should things continue to be challenging. All of this is set in a vast open world set within the ruins of some unidentified city, beautifully detailed with overgrowth, crumbling buildings, and wildlife roaming around (oddly enough, the only survivors were moose and boars…you tell me). You’ll come across a vast desert, an abandoned amusement park, and a dense forest with an occupied castle within. The emptiness might be a bit unnerving at first, with only two outposts within the enemy-filled spaces in between. But it makes sense within the context of the story, which gives the setting more of a bleak outlook in keeping with the overall tone. Apart from the main story, some of the side characters will give you side quests, which I would argue is, at least structurally, the weakest part of the game. While the plotlines of each side quest are intriguing and follow the same dark philosophical roads the main campaign runs, the actual content is lacking in terms of meaningful interactions. Featuring fetch quests for over 90% of them, there’s not much to say when it comes to how these side missions actually challenge your skills apart from the occasional extra boss or unique enemy encounter. That’s not to say you should avoid the side quests, mind you. Just keep in mind they’re only great for their narratives. While the graphics aren’t up to the standard of some other well-known open-world games, there’s still a lot of beauty to find. Same goes for the character models, with unique designs that make them as memorable as they are quirky and damaged. The sound design is nothing short of stunning as well, with the environmental effects of the wind brushing through the grass alongside the clanging of metal on metal when fighting machines is on point throughout. 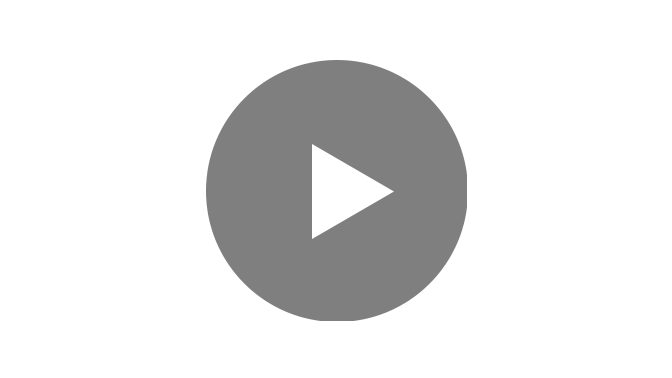 Punctuating the action is a wonderful soundtrack that combines a traditional orchestral score with electronic beats and even human vocals in various languages, dynamically shifting in tone, intensity, and drama as you go through various moments and areas in the game. The actual game performance is also fantastic, running at a smooth 60 FPS with only an occasional small drop whenever combat starts getting too hectic. 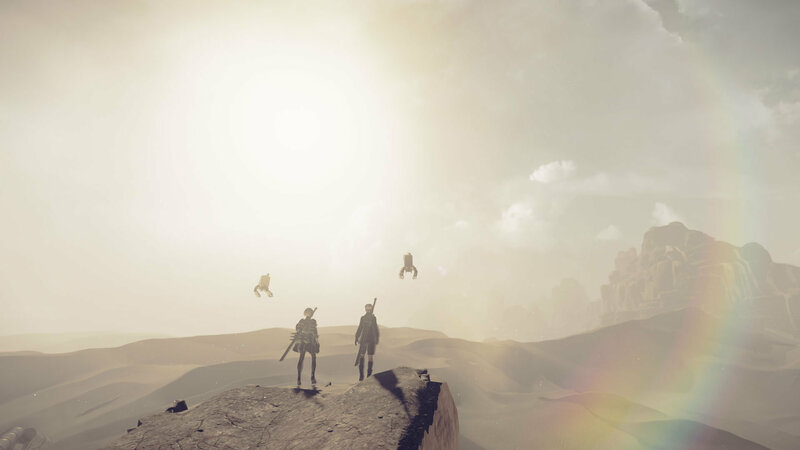 Overall, I couldn’t find much technically wrong with Nier: Automata, apart from some instances of model clipping and animation glitches. The game features virtually no pop-in, and while the fidelity isn’t quite as high, the art design is incredible and detailed enough that I can forgive them. If I did have to complain about something (and I do, because I’m fair, dammit! ), it’s that the third and final act of the game feels a little bit rushed. Perhaps the developers struggled to find enough time to get the game released. Story beats come along with decent but minimal explanations. A new character gets introduced with a gameplay feature that is honestly useless. It also features a final ending that, without taking into account its context within the narrative, becomes a frustratingly brutal affair that only the most ardent of bullet hell aficionados can appreciate. 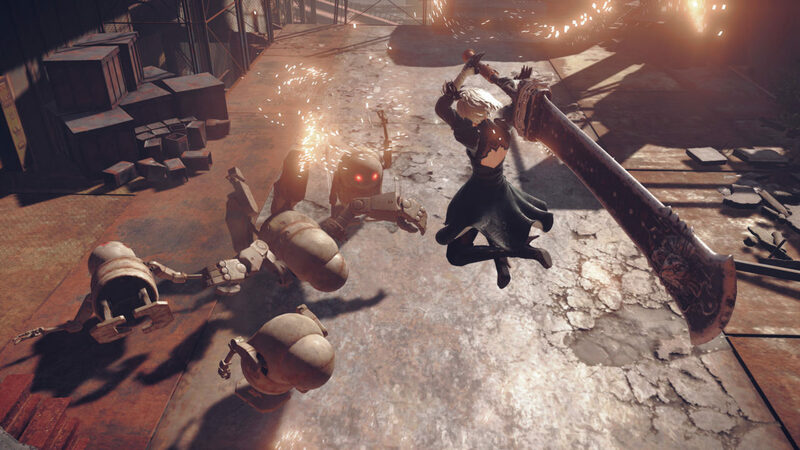 Regardless of these complaints, Nier: Automata challenged me in a way I didn’t expect. The gameplay itself was easy enough to grasp, but the philosophical nature of the story gave me pause to think about what my role is in this world, and whether I had a purpose to my existence. The game will not give you a straight answer to challenge this way of thinking; only interpretations of how to handle some of life’s hardest questions. By fighting through hoards of evolving machinery and seeing characters at the brink of existential exhaustion, the game asks you: is it worth it? What purpose will you find once it all falls away? Your beliefs, morality, willpower, everything you hold dear could wind up being a lie. And if you’re not prepared, you will despair and fall into an infinite abyss from which crawling out may require more help than you are capable of producing on your own. But in the end, isn’t that the point? Through menial tasks, empty locations, internal warfare with your own self-doubt, you are the person you are, and your actions can determine the course of your future should you choose to abandon vague tradition and focus instead on applying your experience. That’s what I learned. What will you decide? Thinking about buying this game? Buy the game through our site to help fund our efforts to build a better gaming community.